This is our portable St Andrew Cross. It is very sturdy built from 2 x 6 pine board, than painted black. It can also be stained upon request. It is bolted together with 1/4" machine bolts, and lag bolts. There are no nails used on this. 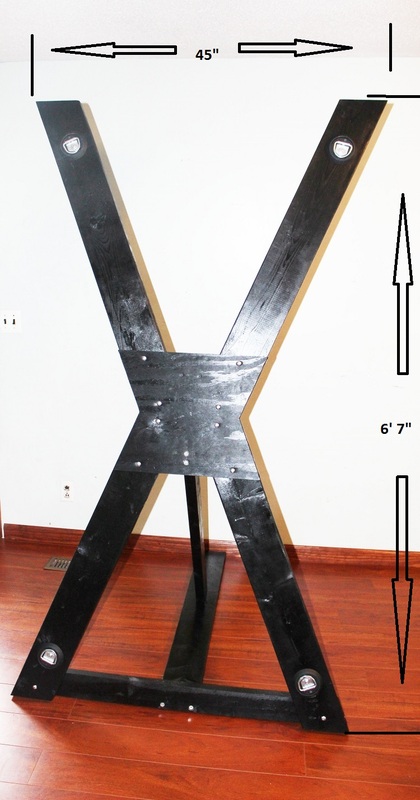 This means it can be easily assembled, or taken apart in about 30 minutes. It stands 6' 7" tall. The legs and arms are spread apart at 22 degree angles. This results in the arms and feet being spread 45" apart. Once taken apart, this can easily be stored under a bed or in a closet. 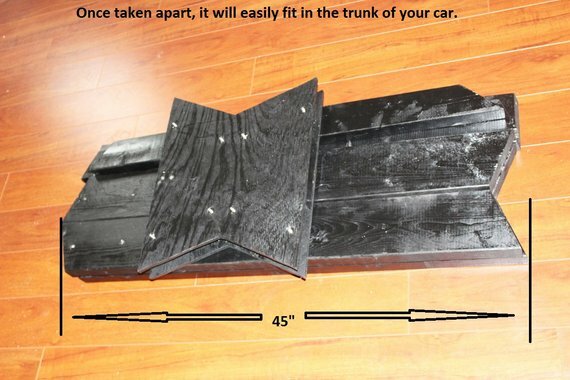 It will easily fit in the trunk of a car as well. This heavy duty construction will not wobble during use. The back stand of the cross must be braced against a wall to prevent sliding.